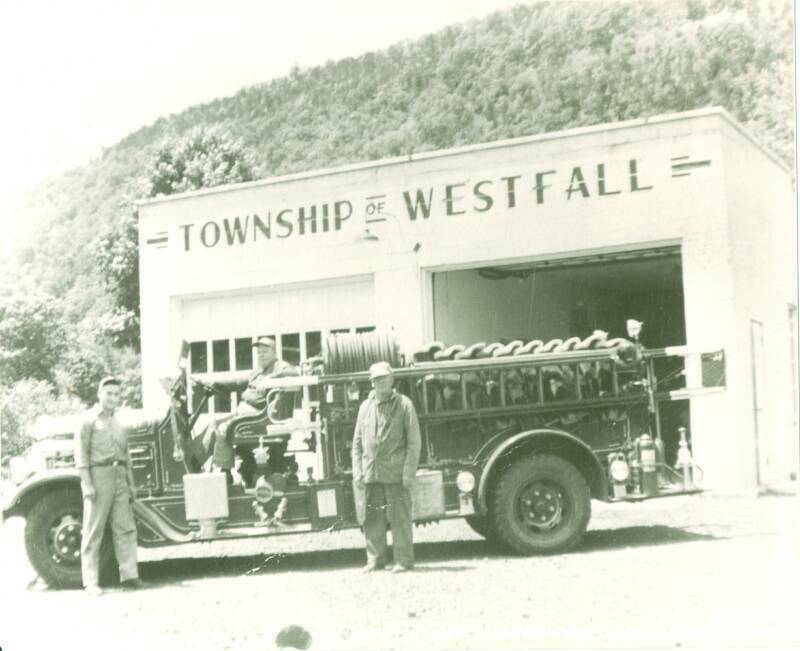 In 1952, a group of community-minded men met in December and organized the Westfall Township Volunteer Fire Department. This group visualized the need for a fire department in what future years would prove to be one of the fastest growing areas of Pike County. The Westfall Township Supervisors allowed the young department to hold its meetings at their township building. In 1954, with very little cash but full of confidence in being able to raise the necessary money, the fire department purchased its first firetruck. It was a 1936 Sanford engine purchased from the Warwick, NY Fire Department. Irving Hulst and Robert Lyon were the proud drivers who delivered the "new" truck to Westfall. Although the Sanford was an open cab and loud, it was fast and served the department well. The truck was used extensively during the 1955 flood. 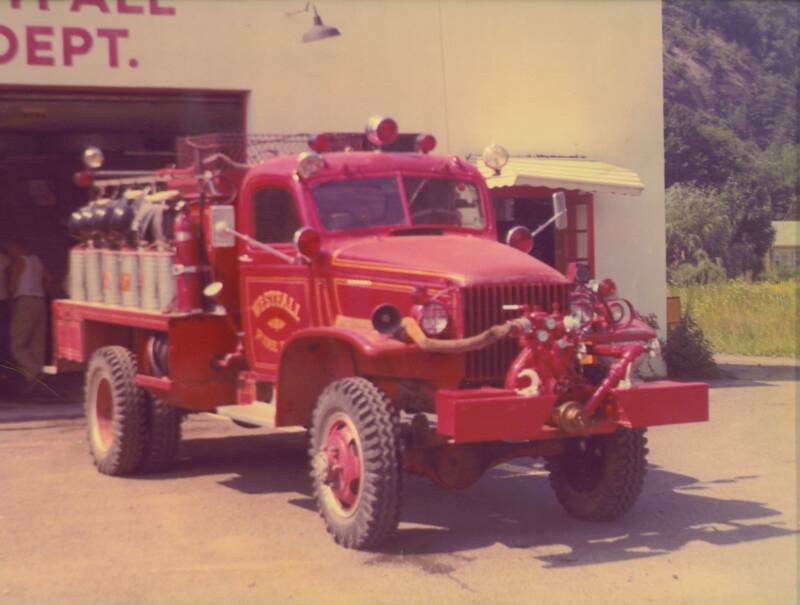 This vehicle remained in service until 1961 prior being sold to the Mill Rift Fire Department. department would do almost anything to raise money for equipment, in late 1958 the department attempted to purchase a Willy's Fire Engine with the use of Blue Stamp Books. It seemed like a good idea. After all, they only needed to 3,995 completed books and set a goal of obtaining the books within four months. Needless to say, it didn't happen as planned. Of course, as the fire department grew, the need for additional space was also apparent. The original Westfall Township Building consisted of nothing more than a two-bay garage. The township had been generous enough to allow the fledging department the use of one of the bays. But with the purchase of a second truck, the department needed more space. So an agreement was worked out with the township officials in which the township agreed to supply the building materials, the fire department agreed to supply the labor and a third bay was added. Department members spent many hours, nights and weekends completing this project.. 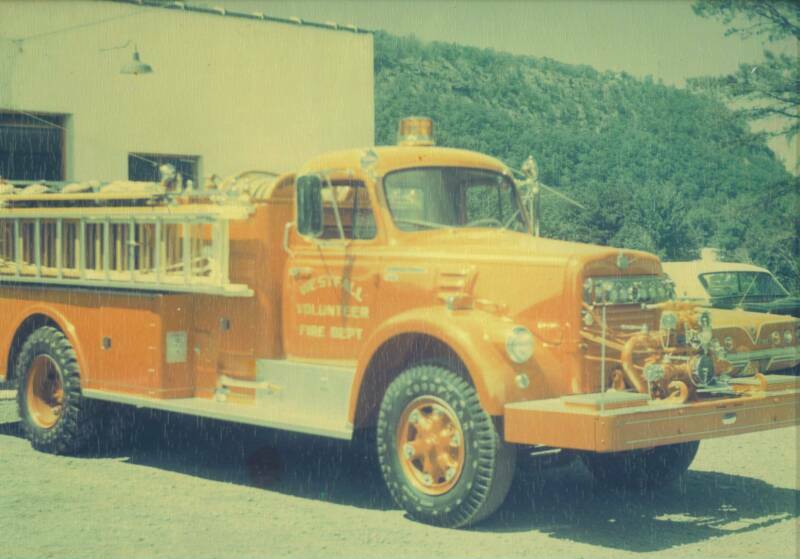 In 1961, a third truck was purchased from the Lynbrook, NY fire department to replace the 1936 Sanford. It was a 1947 Seagrave. Stories go, that certain department members decided to really test the pumping capacity before leaving Long Island and stopped at the first hydrant they saw. It indeed did pump and pump alot. Unfortunately local officials did not like the idea of a bunch of guys from PA wasting all that water and were politely ushered out of town. The Seagrave also served teh department well. In its later years of service, it was known to have a thirst for oil, but would still pump with the best of them. Since the formation of the department in 1952, it was always the goal to be able to purchase new equipment. Although department members worked every conceivable type of fund raiser that they could think of, and members had a certain knack for "acquiring" needed items, it appeared that the dream was always just beyond reach. Money was constantly being put in the truck fund hoping that some day it would become a reality. 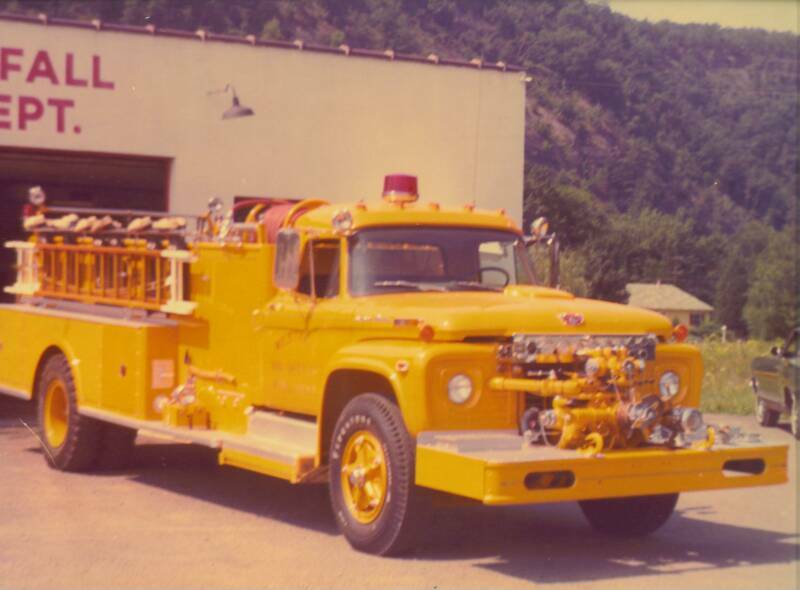 In May 1966, with the backing of Irv Hulst, the dream of purchasing a brand new fire truck did become a reality when the department took delivery of an American pumper on an International chassis. It replaced the aging Seagrave. The new truck had a 750 GPM front mount pump and carried 750 gallons of water. 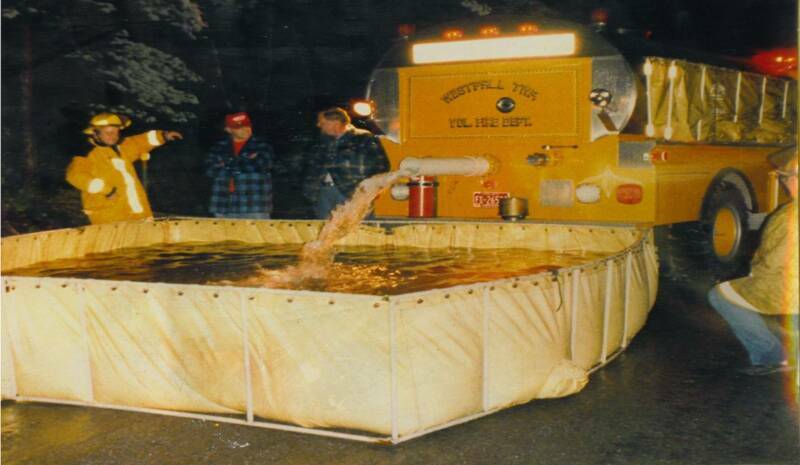 Over the years, it developed a reputation of being a fine pumper. At many fires, it delivered far above its rated pump capacity. It remained in service until 1985 when it was sold to Rockland Fire Department in New York. Appearing Apparatus" trophies over the years. Other fire departments were always trying to beat those guys with that "damn" yellow fire truck. This truck remained in service with the department until 1991 when it was sold to the Mill Rift Fire Department. In 1972, it was decided that the department had once again outgrown the buildind. The department now had three vehicles, although the old Chevy was now used mostly for brush fires. The department borrowed $25,000 for buildind work. Once completed, the size of the firehouse had more than doubled. Unfortunately, the basement could not be used for its intended purpose for a number of years because of the constant flooding problems. With the enlarged building, the department soon started holding weekly Bingo games. With this increased revenue, the department was able to pay back the entire building loan by June of 1975. Through continued support, money was raised and additional changes to the building soon occurred, including improvements to the kitchen, the outside and solving the water problem in the basement. 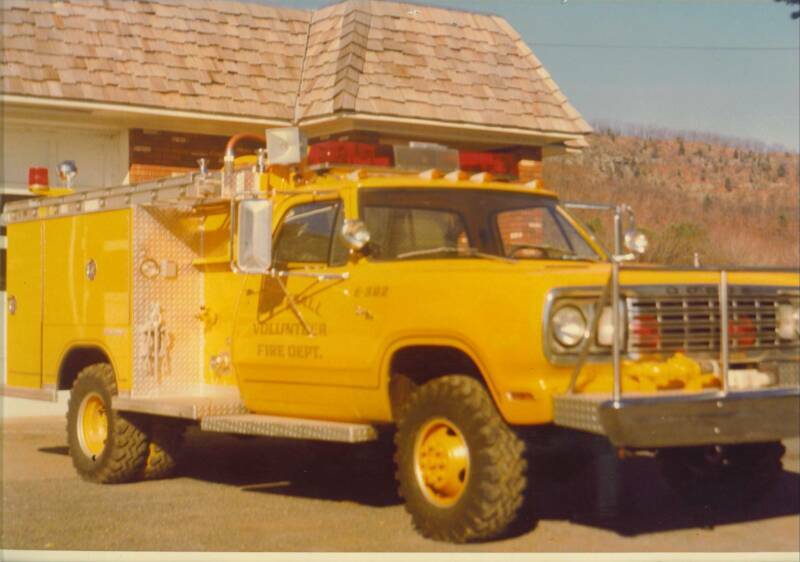 In 1977, the old Chevy was finally retired and sold to the Huguenot Fire Department. In its place, a 1977 Dodge Saulsbury mini-pumper was purchased, arriving in November of that year. The department borrowed $15,000 from Pennyslvania's new volunteer loan fund to help cover the $30,000 plus price tag. For many years, this unit was the first piece of equipment out the door for every type of call. Although it only carried 250 gallons of water, many fires were quickly contained because of the fast response. In later years, this vehicle was used extensively for response to medical calls. This truck too, developed a reputation for winning trophies. In 1980, for the first time the department responded to over 100 alarms in a single year. In 1981, the department took a giant leap in its firefighting abilities when it decided to add a fourth truck, a tanker. The truck was manufactured by 4-Guys Stainless and mounted on a 1982 International chassis. It carries 2,000 gallons of water and has a 500 GPM pump. This would make the departments most expensive purchase up to that time. Again, the department borrowed money from the Pennsylvania loans fund. This tanker has proven itself many times. 1981 also saw a revision in the by-laws that for the first time would allow junior members to join. With the passage of the revision, the department soon grew by over a dozen 16 and 17 year olds, who soon gave the department many new and often interesting problems to deal with. In 1984, with the purchase of 1,100 feet of 4-inch hose, the Westfall Fire Department became one of the first departments in the Tri-State are to purchase large diameter hose. In 1985, the department began designing a new pumper. But this time, it would be a custom pumper. Although the department had now purchased four brand new vehicles over the past twenty years, none of the units were on a custom chassis. Many of the original surviving charter members saw this as a goal to say that the department had finally made it. Unfortunately, one of those driving forces, Robert Lyon died shortly after the truck was ordered. In November 1985, the department voted to dedicate the new truck in Bob's memory and named it the "Big Lyon". A formal dedication was held in April 1987 for the 1986 Pierce Arrow. It carries 1,000 gallons of water and has a 1,250 GPM midship pump. It is the first diesel powered vehicle the department purchased. Having paid off the mini-pumper, the department again turned to the Pennsylvania volunteer loan fund. In 1986 with the anticipation of the new county-wide alert system about to go online, the department purchased its first eight motorola pagers. Obviously, many more have been purchased since that time. In 1987 with the increase in population, it became obvious that there was a need for additional trained medical people within the community to assist the local ambulance corps. Seeing that need, the Westfall Fire Department was one of the first fire departments in Pike County to organize a Quick Response team. Equipment was obtained and placed on the Mini-Pumper and the department began to respond to every medical call within Westfall Township. of the members and to the support of the community. 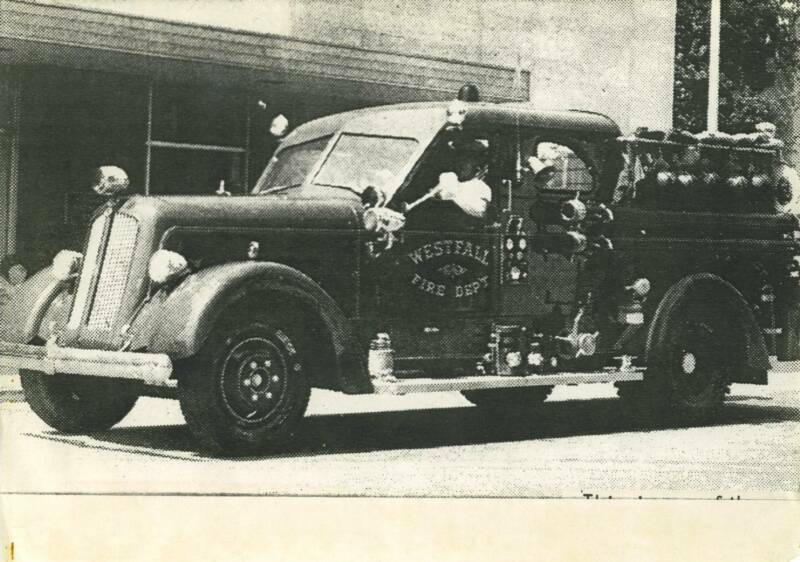 Although the Westfall Fire Department had been very instrumental in the 1960's with the formation of a dive squad within the Tri-State area, the department had not been an active participant since the early 1970s. That changed in the early 1990s when the department reactivated the dive squad with the purchase of a boat. All in all, the Westfall Fire Department has stood by its community for the past 53 years, and will continue to help in times of emergencies. This is all made possible by the dedication of its many volunteers, as well as the generous support of the community.